Images © Officine Mache; used with permission. Contact Officine Mache for pricing and availablity. 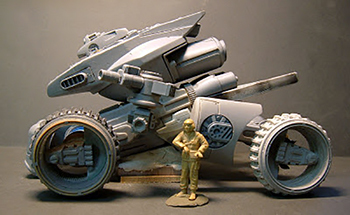 There are but a few Science Fiction resin vehicle model kits released each year, and of them, most are designed after a movie, television show, cartoon, comic, or some design seen in some form of televised or printed media. Very few are actually original concepts. Thus when I first saw Officine Mache's EVO-T, I couldn't help but feel enamored with it. Here was a model that had a very futuristic appearance like no other and did not resemble any modern or past vehicle. I like the sleek looks, the huge tires, the intricate detailing, and the very concept that this vehicle is one fast mover, not to mention an original Science Fiction design piece, something I've been waiting for a long time. The EVO-T Evolution Tank concept ("LTB-001-ET "A German Impache Concept Design"") has no equal in that it looks like no traditional tank: part armored car, part fast-attack vehicle, part Monster Truck, and part weapons carrier, the EVO-T seems to hide most of its capabilities in the Upper Turret, Lower Hull, and wheels. While it does appear lightly armed with a short side-mounted cannon (seemingly 120mm diameter) and a rocket pod (1/72 scale so supposedly anti-personnel only), one could only guess what its true offensive and defensive capabilities are lying underneath all those engraved panel coverings and protruding hatches on the turret. For sure, the EVO-T looks fast and fierce, dwarfing a 1/35 figure in height and size. The Officine Mache kit comes in 26 solid resin pieces in light gray, cream or beige packed finely in a cardboard box complete with bubble-wrap and Styrofoam popcorn. The main parts of turret, hull, and tires have their own plastic baggie whereas the remaining parts are divided into two plastic baggies. An instruction sheet with nice sharp contrasting black and white photos is included. Since these pieces are fictional and don't compare to anything in current times, I cannot really identify what purpose some of the pieces represent so I'm going to have to create names for some them. Most of the resin pieces are huge, heavy, and solid, quite a casting feat to be able to pour and pull from the mold such a large solid piece without warpage or damage to the intricate details. This is far from being a delicate hollow tank as most plastic tank kits are. Nevertheless, this wheeled tank is not a wargaming piece, meaning this model kit does come with pieces, intricate details, and parts that are not molded on. Those parts that are molded on appear very crisp and detailed: there are bolted-on hatches, sensor doghouse, piping, latches, access covers, ribbing, vertical launch missile heads, bolt heads, springs, and exhaust vents all crisply molded onto pieces of this vehicle. The level of detail just looks phenomenal and best of all not readily identifiable. I could pick out a few pieces that came from a modern AFV plastic tank kit but these have been cut off from their main piece and fitted neatly into the vehicle that one cannot definitely say that the designer used that very piece. The tires themselves are works of art. 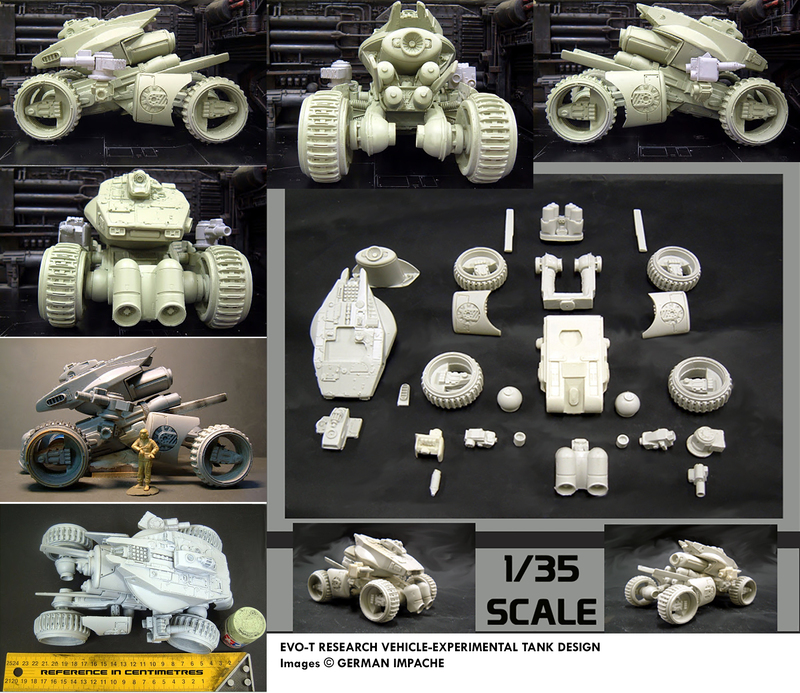 Measuring 45 centimeters in diameter, they have got to be some of the largest wheels on a 1/35 vehicle outside of the ALIENS APC. The outside shoe details and interior ribbing has minimal distortions or warping. Cleanup is necessary though as some tires have a huge pour block block or thin interior flash to remove and some shoe treads have minor resin blobs that require picking out. Overall, unless one inspects closely, one will hardly see the minor imperfections once the pour block is removed. I testfitted two tires to the rear forked axle mounting hole and discovered that one fit and one did not. In order to get the tires to fit, one has to sand the cylindrical mounting plug smooth. I found that three of the tire mounting plugs were kind of splayed out on the edge. The Main Upper Turret has some of the best molded-on details since the viewer will see this piece the most. There's a 20-cell Vertical Launch System complete with individual missile heads at the rear of the turret. There's a profusion of small hatches and coverings and lots of flush hatches with engraved panel lines. I'm not quite sure if the EVO-T is a remote-controlled or autonomous tank because of the lack of defined crew hatches and forward sensors. In any case, the Main Upper Turret looks nearly perfect. The underside does have some sinkholes that require filling and rough areas that need sanding although I don't believe the viewer could see them once the model is built. I test-fitted the Upper Turret's plug to the Lower Hull's hole and the two pieces fit well. The Lower Hull is cast as a solid piece, complete with molded-on details such as plating, hatches, springs, grills, and vents. The detailing looks superb, as if the molded-on pieces have a purpose and place around the hull. The casting is smooth on the areas the modeler will see and there are very few sinkholes in places where other parts will join together. Overall, the Lower Hull resembles a fine quality piece. The additional parts are cast well with smooth clean crisply-detailed surfaces where the exteriors are visible. The pieces are solid, sturdy, and non-stinky. I could see straight and smooth engraved panel lines, clean bolt heads, crisply defined raised handles and latches, and straight ribbing. Many of these pieces are thick and study; this is a well-engineered model that should be able to support the weight of the heavy Lower Hull and Upper Turret body. There are the occasional pour block blobs on some pieces which one has to saw and sand off. Mache sawed off most of the pour blocks from the pieces, leaving remnants or rough areas, such as the rear axle fork, that require fine sanding. I could detect some very tiny sinkholes in the heatsink bars and canon weapons housing pivot which should be pretty easy to fix for an experienced resin modeler. Most of the pieces however have little to no imperfections which is a good testament to Mache's casting quality control. The 11x14 inch instruction sheet with its focused photos looks great. Either laser printed or photocopied, I could see photos of how the assemble the kit in subassemblies, the completed vehicle, a parts breakdown, and also read tips on resin safety. No colors or camouflage scheme means that the modeler could paint the EVO-T however desired. No decals are included so one has to use those in the spares box for any desired markings. Overall, the minor issues I found with this kit could easily be corrected by the experienced resin modelmaker. The parts mostly appear well-cast and devoid of surface errors, warping, deformities, or damage. After all, this 1/35 kit, when built, will create one of the coolest-looking Science Fiction vehicles on the model market. The wide surfaces of the resin pieces would be ideally suited for super-detailing if desired. I am impressed with the pieces and cannot wait to build this kit. Thanks goes to my wallet and to Officine Mache for the discounted price on this model kit. Photos are from Officine Mache and are used with permission. Manufacturers and retailers, interested in getting your wares reviewed and publicized on a site averaging 6000+ readers a day? Contact us! This page copyright © 2015 Starship Modeler. First posted on 28 January 2015.